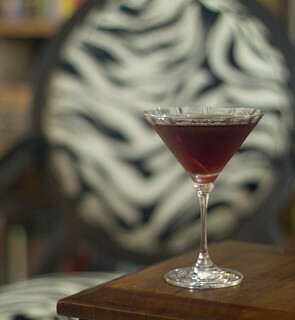 B forwarded me a post from Michael Rhuhulman’s blog about a Berkshire Martinez from last April, which was his take on the classic Martinez cocktail. Apparently this post was inspired by a robust (such as 140 characters will allow) Twitter discussion of his previous post on The Perfect Martini started by Gerry Jobe, bartender at RauDZ. I was preparing to give the Martinez a whirls when I caught passing comment by Jobe that a “Punt e Mes for its bitter quality works extremely well with Aperol (substituted for Campari) as a Negroni variation”. Well, I’m always game for cocktails that use either Punt e Mes or Aperol. So I did a little digging around to see if someone had come up with a reasonable name for such a drink and ran across the Aperoni at TwinFountain, which is fortuitous as it’s a great blog with an ethos I appreciate—”I like my cocktails simple. Usually brown and stirred. Often bitter. … Made with affordable ingredients.” My thoughts exactly. Stir all of the ingredients with ice and strain into a chilled cocktail glass. Add a a healthy orange twist. I am not one who is normally taken by “a modern take on a classic”, but I actually think I like this cocktail slightly better than the original Negroni. 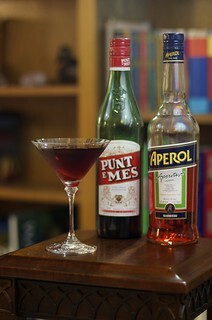 The Punt e Mes and Aperol just harmonize exceptionally well. It’s still a serious, bitter cocktail, but there’s just some little extra bit of alchemy there. This is definitely one that’s going into our regular rotation. I’d like to try this again side-by-side with the original negroni. It was very tasty though. Glad you liked it. I agree with your upping the amount of Punt e Mes, as well. Killer! Thanks for the shout-out, and glad that you gave this a whirl! Cheers! Wow! The recipe sounds good. I’ve bookmarked it. Unfortunately I still have not got Punt E Mes, but, how do you think, can I use plain sweet vermouth (like Martini or Cinzano) instead of it? As it turns out, I did just such an experiment a few weeks ago (can’t quite remember the cocktail), but we were running low on the Punt E Mes and so I poured a little of it and a little Martini and Rossi in glasses and tried them side by side. They are very similar, so I definitely think Cinzano or Martini and Rossi are fine substitutes. Cheers.